Problem: Customer required additional drying capacity. With no available space and limited boiler capacity, adding another loop dryer meant a considerable investment in floor space. 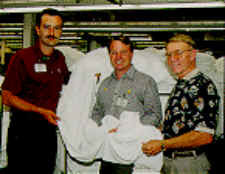 Analysis: Vacuum extractors might help, but would also snag terry cloth and mean a decrease in production. 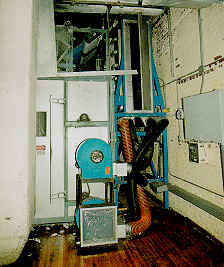 Solution: Blair Mills decided to install a Radiation Systems' electric air-flow infrared (IR) predryer in the 12 ft. long space between its larger loop dryer and a solid brick wall. To save power and avoid harming the cloth, a tach-speed switch turns the electric IR predryer off whenever line speed dips under 7 yd/min. Small Footprint: The RSI electric IR predryer is 14 ft x 3.8 ft, or 53 sq. ft.
Project Cost of the for the electric IR unit was approximately $100,000. Payback period was estimated to be less than 12 months.